Look, I’ve been loving this Lady Knight book over at Mark Reads. But I had a bit of a disappointing experience last week: I got to the last chapter and there WASN’T a climactic battle with the main villain. Can you believe that? Sure, there was a thrilling castle infiltration scene and an excellent fight with the warrior bodyguard–but when it came time to finish the head honcho himself? Done in two pages with little effort! I’m not upset though; this is one of the reasons I wanted to write stories of my own. I realize that authors won’t always do what I want them to do. They’ll spend hundreds of pages hyping up a character. Then when he finally appears they’ll have him say a handful of lines before getting cut down in one stroke. I’ve come to accept it. They do things their way; I do things my way. And what is my way? An epic struggle against the antagonist for seven straight chapters! YEAH–HA HA! The sun shone on the four gathered on the Nine-Mile Road. Tome blinked: his blond hair was sticking out past his brow as the sweat dripping from his face flew off him. His body was trembling as he stood, bracing himself. Cracks ran along the concrete road, criss-crossing at a square indentation where the bottom of Pinada’s cube was wedged. “Sing, you’re only going to end up hurting your friends,” Pinada told him. His hand was on the case, where bits of yellow grass blades and seeds were sticking. The plants on both sides of the road bobbed toward him with a steady sway. Darrow stood inside the gazebo, hugging one of the wooden supports. Vornis was crouched, gripping the street with his claws. Tome toppled forward. He caught himself and rolled across the road. The debris fell from Pinada’s case. The grass in the field flexed straight again. Vornis grit his white teeth and leapt at Pinada’s case with arms outstretched. He took hold of one of the spires on the way down, snapping it off. “You brute. That one was my favorite; it had King’s crown on it,” Pinada told him. He placed his hand on the back pane and the cube jolted forward, slamming into Vornis’ chest. The beast was sent onto his back, skidding across the gravel along with the fallen spire. Pinada leapt in his case again, coming down on Vornis’ legs and pinning them. He slid the case forward, bringing the edge of the cube to Vornis’ neck. A spot of fog pulsed on the bottom of the case as the beast’s breath seethed onto it. “You know why she isn’t!” Vornis bellowed. Pinada hummed, toying with his scarf. Vornis ceased with his struggling. The ferocity drained from his face. “Zen–” Vornis muttered, and his eyes drifted to the plains and the swaying grass there. Pinada unsheathed the rapier: revealing the slim blade with no edge and a needle’s point. He took a step back, directing the tip at Vornis’ kneecap under the glass. “Yeah that’s too bad,” he said. He plunged the sword through the bottom of the cube with no effort or noise, piercing Vornis’ leg. He winced as Pinada dragged the blade out. Blood gathered on the bottom of the glass, leaving the sword clean as it withdrew back into the cube. Pinada touched the plate at his side, and the tiny hole at his feet sealed. He tipped the blade forward, pointing the tip at Vornis’ chest. A pop came from his left and Pinada looked: Mean and Dark were standing at the gazebo. Pinada caught himself as his cube was thrown off Vornis’ body. The bottom plate skidded across the road and he laughed as he slid to a halt. “Vornis, you guys okay?” Mean asked. She dropped in next to him. He grunted over at Tome, who was struggling to get back on his feet. “Yeah,” Mean affirmed. “Just stay here; an ambulance might be coming.” Dark held the hem of his cape close to him as he rushed over to Tome. Mean ignored him. “I’m going to the mine,” she told Vornis, and he gave her a hasty nod. She darted away and leapt: soaring down the road. Soon she reached the end where a large, paved lot stood barren. She continued straight past it; flying over the grass, heading toward a far-off boulder that marked the entrance to the mine. Pinada kept his eyes on her and he placed his hand on the back of his case. He bounded past Vornis’ grasping arms, in pursuit. He wove around Tome, dipping a bit as an unseen spell tugged at him. Pinada continued forward, meeting one last person near the road’s end: Darrow. He had a mug in his hand, winding it back. He tossed it at Pinada with a scowl. It struck the front plate, bounced off, and clattered to the road. Pinada pulled his rapier half-way from its sheath. Darrow flinched, sniffling. Pinada scoffed, slamming the sword back in. He gazed past Darrow, zipping around him. “Alright, don’t look back,” Mean told herself. With a kick she burst to full speed: keeping her eyes narrow as wind whipped at her scalp. The massive stone was just ahead, sitting in a clearing along with the hex door leading down. A stretch of yellow grass was between her and the rock. A pane of glass whipped up out of it; Mean swerved. The glinting, square plate buzzed ahead of her, smashing into two of the pillars marking the door. The middle of each one warped inward and the glass remained stuck. Mean landed next to it two seconds later. “Crap,” she muttered, flinging the glass out of the way. She stood in the center of the hex door. It buzzed at her. She grumbled, hopping out and checking the massive boulder nearby. Lengths of rusted chain were attached to the rock, and a stairway with flattened railings poked out from under it all. Mean went to the top step, touching the stone resting atop it. It responded, lifting up: the chain links clinking as the sunlight revealed a metallic platform underneath. Mean took a step down into the crack. “Lights?” she whispered. The space beyond brightened. A vast cavern floor came into focus far below the platform’s railing. She slipped in, setting the boulder back into place with a thump. She coughed from the dust drizzling overhead and peered over the rail. The floor of the cave was far below, and the lumpy ground was lit with an even haze. 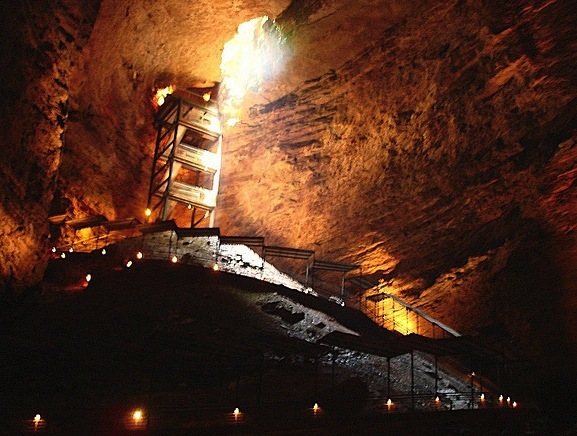 At her side, stairs wound along the sides of the cavern’s wide edges: fastened in place with bolts and leading in a wide arc down to the floor. Mean ignored them and leapt over the side. Cool air rushed over her skin as she dropped. A hill of loose stone and rubble was piled up directly her; she drifted forward, snapping her heels down on a smooth stretch of flat stone. As she scanned the walls for any possible way to continue, a dull thud from above diverted her attention. She looked up and gasped: a large, painted eye stared back down at her. It was carved into the bottom of the rock that sealed the cave’s roof. The eye stretched wide, tapered at the ends. It was framed with a red circle. A third tunnel had the wire obstructions torn away, exposing a lit path. “BUT I CAN SEE YOU,” was painted over it. Mean shivered, holding her arms close to her body as she trotted through. The path was wide for the first half. Large sheets of burlap were stretched across the walls, pinned in place by rusted nails. Further in, where the sides of the tunnel narrowed, the glossy earth was chipped away in precise, square edges. Ahead there was a sharp decline. Mean paused, and the quiet was broken by the boom of the massive entry rock falling. The noise was still resonating as Pinada called out: “You shouldn’t be down here.” His voice echoed and Mean leapt down the pit. Her feet touched down on a paved path and she raced ahead–half flying, half sprinting–over the dusty track. Every surface was lit by invisible sources; the slick walls displayed doodles and repeating words. ‘CIRCLE, CIRCLE,’ as Mean leapt a crevasse, ‘CIRCUS, SHIRK IT,’ as she reached a passage running perpendicular to the one she was in. Conical rock formations held a small basin of water. “Crap–which way, which way?” she chattered, hopping on her heels. Large chunks of stone sat to the left; on the right the way was clear. The far-off grinding of Pinada’s case against stone spurred her though the easiest choice. She bounded through, passing a hex door set into one of the walls. Ahead, metallic, textured slabs were set along a zigzagging stone path. As Mean scrambled across them, she spotted a small sign hanging from twin chains. “Hall Zone ahead” was written upon it, and she stumbled over something as she broke into a wider, oblong chamber. The footing was slanted and she rushed down through the haphazard lighting. Another sign dangled here; one of its chains was ripped in two. “Hall Zone” it read, though its lettering was defaced with red marks: A horizontal slash bisected the “a,” while numerous, interlinked zeroes were scribbled after the “Z.” Mean jerked to a halt as she reached a long rail barring her way. With a gasp she shivered back: all light beyond that point ceased. Her eyes followed the railing and it made a long curve to her right: following an unseen path through intermittent spots of light, along a wall dotted with scribbles of eyes, chain links, and faces. Mean spotted a bright patch far across the unlit expanse: a square breach in the wall where a strong light shone through. Her sandals scraped from the cold floor and her body lifted to a hover. She put a foot on the rail. The darkness above and below her was still. Her own breath startled her, rasping loud. With a jerk she set off across the black, empty space. She held her arms close to her body and her feet tight together; risking nothing to the void as she flew toward the far-off square of light. The rushing of air over her ears eased the quiet as she flew, and a nervous hum built at her lips as she kept her eyes on the passage. Sweat trailed over her skin and tears blurred her vision; when the opposite railing drew up she flew past it: zooming through the radiant opening. The tall, steel supports from her first visit were still there, and she weaved around the few that stood between her and the far side of the bright chamber. Mean slowed near the joined stalactite and stalagmite formation: with the distinctive, sandy streak down the middle. The area where the console had been was scraped bare. A large, hexagon-shaped indention marred the floor. She turned back to the vast cavern behind her. The floodlights on the ceiling cast long, twisted shadows on the floor. Many strips of coaster track had been attached to the tall pillars: torn into segments and spiraling around them. Pinada was gliding out from the hole in the wall. Trisk’s sweater hung on one of the two remaining spires on top of his cube. The mandala design on the front was pierced through. With a shriek of metal wrenching from its place, Mean brought down a spiral of twisted track onto him. He gave the glass an absent touch and the metal bounced upon impact, fragmenting into five large pieces and clanging to the chamber floor. “Shut up! You don’t get to talk about them!” Mean cried, dragging another piece of the track from the pillars. Mean caught the rail in her tiny hands and swung. The metal struck, wrapping around the corner of Pinada’s square case. The third spire was crushed beneath it. “I didn’t know,” Mean said, sniffing. She dropped her end of the rail, looking past the cube as the metal fell away from it. Dark was sweeping into the room with his cape held around him. Tome followed, brushing dust from his blond hair. “Mean, where is it? Is it still there?” Tome asked, shouting. Mean stamped on the floor. Tome pushed his way in front of Dark. He chuckled and coughed into his scarf as Tome walked right up to his casing. “Tome, stay back,” Dark said. “Yes, stop posturing,” Pinada chided. “You’ll just float out of your body again. You cheater.” He did his best to mimic Kay Kary’s voice. Tome stood still and Pinada put his hands in his pockets. He made a slow revolution with his case, grinding against the cave’s floor. “His–you found it?” Tome asked. Dark gave a curt nod. He drew the rapier from its scabbard, pointing the long, needle blade at the glass. Coughing again, he drove the point through the case; piercing in and out with a long glide. A small hiss whined through the hole. A white glow burst from beneath Darklord’s cape, sweeping out in radiant strands. Mean and Tome were engulfed as the wave rushed forward, crashing against Pinada’s square walls. A tiny, slimy head poked out from under Dark’s arm. “That–!” Pinada choked, yanking the sword free. He tossed it down and slammed his palm to the case; tendrils of light squirmed past his fingers through the holes in the glass. The tendrils retracted: clinging to both sides of Pinada’s walls as they withdrew. The side Pinada was touching tipped outward and broke free from the cube; the last spire wobbled off, spilling its trophies to the cave’s floor. “How did it–” Pinada gasped, covering his head with his arm as the three other walls at his sides gave way. The top plate fell upon him, sending him down. The others crashed to the floor, snapping into jagged fragments and skidding outward. “Gotcha,” Dark chuckled as the glow converged on the rory at his chest. He slumped as the floodlights overhead flickered. Mean’s sandals squeaked as she shot forward. “That’s impossible–” Pinada coughed, shrugging off the large top plate. He stood with the broken glass at his feet, watching Mean run right over. He gave a reflexive toss of his hand to the empty space between them; Mean’s fist drifted past and struck him in the neck. His eyes crossed and he sputtered; she took the neck of his coat and jerked the collar down to his elbows. “You can’t touch me,” Pinada gasped as Mean kicked his legs out from under him. He crumpled to the floor and she leapt on his chest, beating at him with her tiny hands. Vornis tightened a slick band of cloth at his wounded knee. He grunted, staring off in the direction of the mine. Darrow brightened, placing his hands on the asphalt as he sat. Dark shuffled forward, dragging his heels. Pinada lay on the ground before him, his eyes blank and bruises swelling up at his cheeks. Mean stood over his body with her hands balled up into fists. With a curt sigh she scanned the glass at her feet. Reaching down, she pulled the needle-edged sword from the mess. She turned, flicking her hair back with a toss of the head. A smile crossed her face as she set her free hand on his shoulder. “Gotcha,” she sang, drawing the blade back and running him through with one stroke. I’m so glad that Tome finally has some quality time with Pinada. Now he can stand there and listen to all these great insults I came up with! I’ll remember this spot just in case I need to add any more. Or in case I need to add something relevant to the plot, I suppose. In the first draft Vornis was standing right in front of Pinada when he got stabbed. His instincts have taught him how to dodge sword thrusts from his match with Donzel, so it didn’t seem right for him to be sucker-punched like that. Now he’s trapped under the case when Pinada gores him, making this more feasible. And if you STILL think Vornis could have escaped then I’ll just say that he was distracted at the thought of his true love dying needlessly. These tracks are covered, yo. At her side, stairs wound along the sides of the cavern’s wide edges: fastened in place with bolts and leading in a wide arc down to the floor. Now, don’t think I’m being uncreative here! I knew that the producers of Abandonment Party 2: the Movie would have a tough time finding locations to match the ones in the book, so I thought I’d make their future jobs a little bit easier. Hear that, guys? Yeah, you’re welcome! You can thank me by allocating the extra funds toward top-quality explosions and comet impacts. I wanted there to be a link between the name “Hellzoo” and the hall experiment that attracted her to the planet. At least, that’s what I think I did. I honestly can’t remember if I planned this or if I just got lucky. Huh. I changed Vornis’ final line to be a little more vindictive. And then we get to see Pinada’s face immediately after, haha. Pinada lay on the ground before him, his eyes blank and bruises swelling up at his cheeks. In the first draft there was blood, but I changed it to bruises. Mean doesn’t have any magic in her right now, so she can’t use gravity to weight her punches like she normally can. Without her magic she isn’t that strong. Unless she has a sharp sword in her hands, that is. Well, Matt, I asked you if you could figure out what was happening next. You said you didn’t know, but you were sure it would be an amazing explanation. I WILL AWAIT YOUR VERDICT. This entry was posted in Second Drafts and tagged Cocoa, Dark, Darrow, Mean, Pinada, Teery Mine, Tome, Vornis by Brad Smith. Bookmark the permalink.